Upload your DNA to MyHeritage for free for a limited time. MyHeritage now offers DNA uploads from 23andMe (V5) and Living DNA. But don’t wait to take advantage of this great opportunity. Big changes are coming to MyHeritage on December 1st, 2018. Keep reading to learn what this special offer includes! MyHeritage is one of the leading DNA testing companies in the world. They are a leader in the industry as examples of using DNA testing to help reunite birth families with their DNA Quest initiative and offering free DNA kits to reunite separated migrant children. 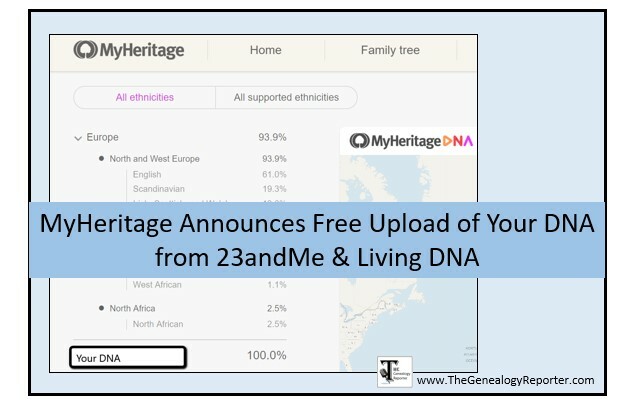 Since 2016, MyHeritage has allowed their users to upload raw DNA data from Ancestry, 23andMe, and Family Tree DNA, for free, providing DNA matches and ethnicity estimates using the MyHeritage system. It was kind of like getting two DNA tests for the price of one! However, MyHeritage did not support the upload of tests based on the chip called GSA (Global Screening Array). This GSA chip was adopted by 23andMe and Living DNA companies, and MyHeritage was unable to accept the uploads of this type of raw DNA data. The good news is, MyHeritage recently made improvements to their DNA algorithms and are now able to support DNA data processed with GSA chips. Whether you have previously tested with AncestryDNA, 23andme, Living DNA, or Family Tree DNA, you can now upload your DNA to MyHeritage. This generous offer will not be available for long. As of December 1st, 2018, MyHeritage policies will change. DNA Matching will remain free for uploaded DNA data, but additional DNA features like the Ethnicity Estimate and the Chromosome Browser will require an extra payment. All DNA data that was uploaded to MyHeritage in the past, and all DNA data that is uploaded now and before December 1st, will continue to enjoy full access to all DNA features for free. DNA Matches – Your DNA is compared to other MyHeritage users DNA from all over the world giving you even more cousin matches. Ethnicity Estimate – This is a percent breakdown of your ethnic background using MyHeritage’s 42 ethnicity regions. First, you will need to download your raw DNA data from the company you tested with. To learn how to download your raw DNA from AncestryDNA, click here. To learn how to download your raw DNA from 23andMe, click here. To learn how to download your raw DNA from Family Tree DNA, click here. To learn how to download your raw DNA from Living DNA, click here. Now, it’s time to upload that raw data to MyHeritage. It’s fast and simple. Click here to start the process. If you manage additional DNA kits for some of your relatives, you must get their permission before uploading their DNA. After uploading, your DNA data will be kept private and secure. You can check out all the DNA terms and services information yourself. You remain the owner of your DNA data, not MyHeritage, so you can delete your DNA at any time. Remember, this announcement is BIG! Many, many people will be trying to download and upload their raw DNA, so if you run into a delay, keep trying! 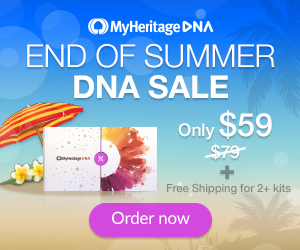 MyHeritage is also currently offering their DNA tests for $59.00 USD and free shipping if you order two or more kits. Click the image below to order your MyHeritage DNA kit today! 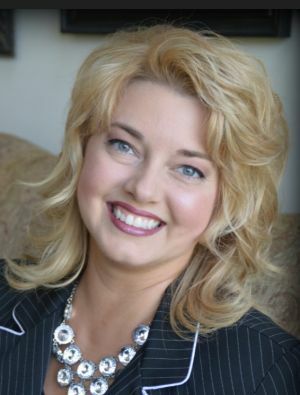 The Genealogy Reporter has entered into an affiliate relationship with MyHeritage. Clicking on the links above my result in a commission being paid to The Genealogy Reporter at no additional cost to you. Uploading from Living DNA is broken as of Jan 31, 2019. The file shows as invalid once uploaded. GedMatch.com took the same file just fine.